When a glittery little book arrived on my doorstep recently, a feeling of awe and wonderment filled my heart. “The Sparkle Box,” by Jill Hardie is absolutely a timeless treasure. 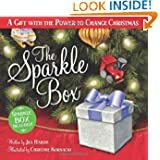 Designed for children (and their adults) this holiday season, “The Sparkle Box” is sure to incite warm feelings of nostalgia for the true meaning of Christmas. With the vast commercialization of the season, the desire for more and better, families–and children–may forget the real reason for the holidays: family, love, Jesus. Open the book, and you’ll immediately be transported to Sam’s world through richly painted artwork by illustrator Christine Kornacki. Like most children, Sam can’t wait for Christmas. He’s excited about the food, the parties, the gifts…yet there is one very curious gift: a sparkly box sitting atop the mantle. Sam’s parents tell him that it’s an important gift that can only be opened together; but they need to fill it first. Throughout the holiday season, Sam and his family give back to their community. He begins to see just how fortuante his family really is. When the family opens the sparkle box on Christmas morning, the true reason for the day is revealed. (hint: it’s the little things they did for others all December). 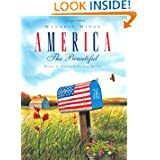 Get the book and read it with your family. (We’re planning on making it part of our advent calendar. Decemeber 1st, “Look for the book under the tree, read it with your family.” THE SPARKLE BOX is available from Amazon, Ideals Publishing (a Guideposts company), & where books are sold. It’s new, but you may be able to request it from your local library. Become aware of the needs in your community. Check with local churches, food pantries, schools, women’s shelters. You may even ask non-profits what’s on their wishlist. If your child(ren) is in speech, PT, OT, etc. ask the owner if they need any new therapy tools/toys/books. Even the library may benefit from gently used books, coats, etc. Purchase or donate. Give with a warm heart and a sparkle in your eye. 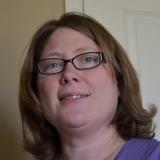 Jill Hardie is a writer, mother, and marketing professional. She and her family started this traditiona about six years ago. They live in Canton, Ohio. Illustrator Christine Kornacki spends her days painting in her studio, which adjoins a charming cafe in New Haven, Conneticut. 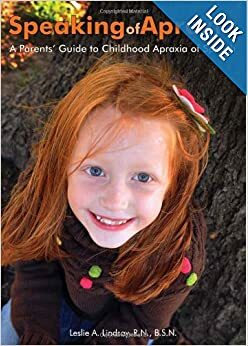 Here’s a repeat post from spring 2013…a great book and tips from Minnesota “apraxia mom” and author! Thanks a bunch for taking the time to chat with us, Heather. 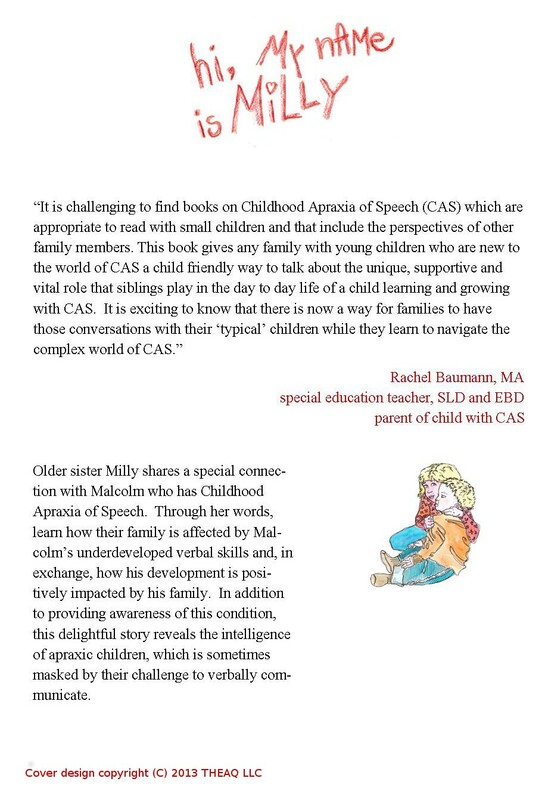 We are super-excited to learn about your new book for kids on apraxia, specifically siblings. Let’s start by getting to know you a bit. Thank you for having me here. I am delighted to share my passion for helping other families who are experiencing CAS. L4K: First of all, you are a busy mother of four—one of which has CAS. Can you tell us a little about the family you are raising and how they have accepted your child with apraxia? H.Z. : I certainly can, Leslie. I am married with 4 children, 3 boys and a girl who are currently in elementary and middle school. As far as sibling acceptance within the family goes, the children have never known anything different. We have worked very hard as a family to provide a loving, supportive environment for each of the children to thrive in. This involves lots of communication and individual time with each of them. L4K: I understand you have a background in sociology. How do you think your education prepared you for raising a child with apraxia? In what ways? H.Z. : Sociology by one definition is the study of social problems. So being non-verbal in a verbal world is a social challenge. This in turn, leads back to the main definition of sociology which is the study of cultures, more specifically, the study of social relationships between people. Surprisingly, the degree has been very helpful. It has provided a framework of reference, in regards to how various people treat Malcolm. It is so easy to be caught up in medical or therapy worlds and how those institutions relate to a person as compared to providing typical childhood experiences on a regular basis. It is a balancing act, to say the least. It also helps that I have a natural, life long, curiosity to understand what is going on inside a person. What makes them tick? Being able to understand and read between the lines of apraxia research is also a benefit. These skills enable me to be a better advocate for all of my children. L4K: How did you dream up the idea to write a book for children about apraxia? I am assuming it all came to you as a mom…but maybe I am wrong? H.Z. : I didn’t dream this up; I LIVED it. [chuckle] When Malcolm was first diagnosed, I had a very verbal 5 year-old, a 1 year old, and was pregnant with our 4th child. My husband was out of town quite a bit for work, so things were beyond crazy in our house. It didn’t help matters that the extended family was convinced that Malcolm would simply “grow out of it.” I looked and looked for a book to read to my 5 year old about what it was like to have a non-verbal sibling. So, I finally took the advice of author Toni Morrison, Pulitzer Prize and Noble Prize for literature winner who said, “If there is a book you really want to read but it hasn’t been written yet, then you must write it.” “hi, My nAMe is MiLLY” is the direct result. L4K: I have to ask about the title—specifically it’s appearance in upper and lower case letters. Was this intentional on your part? And if so, can you share the significance? Funny you should ask, Leslie. The book, “hi, My nAMe is MiLLY” is written from 5 year old Milly’s perspective. Yes, it was intentional and the primary goal is to remind the reader that this is a book from five year old sister Milly’s perspective. 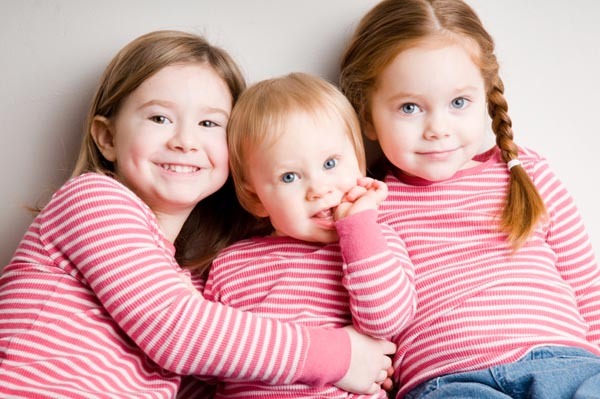 L4K: What do you think siblings of children with apraxia struggle with the most? H.Z. : I think the siblings of apraxic children struggle with many of the same issues of neuro-typical children. This is not an inclusive list by any means: Who does Mom or Dad love more? Am I getting my share of the attention? Are they interested in me? In addition to, there are other themes that have come up in our experience; such as, the feeling of protectiveness towards the CAS sibling, more so than the others. L4K: How can siblings work with one another in the day-to-day struggles of CAS? Do you see them as an instrument in the overall resolution of the speech disorder. How have your own children worked with your child? L4K: What advice would you give to a parent(s) just learning of their child’s diagnosis? H.Z. : Advice is easy to give, but hard to take. I think back to what I would have liked to have known when our journey started. First, remember this is a marathon, not a sprint. It will take time. There will be successes and struggles, try to remember to look at the forest and not the trees. Educate yourself, so that you in turn, can educate others. Make time for each child to have one on one time with their parent(s). Make time for your spouse! Read to your child(ren), even though your CAS child may not respond with the same verbal cues as the other child(ren). Don’t assume that they do not understand the story. There is an amazing person on the inside. Don’t sell them short. Wow! Thank you, Heather! That was truly empowering. We wish you and your family much success with your book. It’s that time of the year when we start winding down–and then up–as we recount the things we are grateful for. Yet teaching children the value of thanksgiving can be tough. It seems the little ones are consumed with material possessions–from television commercials, to the toy aisle, and peer pressure. In my search to help teach my kids the value of generosity, the reason for the season, I came across a couple of items you may be interested in. 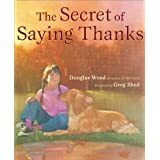 “The Secret of Saying Thanks,” by Douglas Wood (the author of “Old Turtle”) does such an eloquent job of sharing the secret of saying thanks. His beautful, lyrical prose suggests that the best kind of secrets are those that make people feel happy. Oh, how I love that! The illustrations that accompany this book are absoultely delightful. Savor them as you seem to walk into this sun-drenched world of fall foliage, complete with a darling golden retriver, birds, bunnies, and a sweet little girl. The book inspires awe, thought, and even a little glistening tear from the corner of my eye. I plan to read it to my girls, ages 6 and 8 as a pre-Thanksgiving treat. The concept here is that everyone at your Thanksgiving table gathers an item (leaf, acorn) from the bowl as it’s passed around. Each member of the table then talks about something they are grateful for, as they hold the piece, then drop it into the bowl. It serves as a tangible reminder for the season. Now, if you don’t want to purchase this product, simply create your own. Perhaps your family can bundle up, take a stroll around your neighborhood, or surrounding park and collect simple items such as rocks, acorns, sticks, pinecones, etc. Toss ’em into a bowl at home and create a similar experience. This works amazingly well with younger kids who may need things to be a little more concrete. As a family, we often take a Thanksgivig morning hike. We chat about the year behind us, the accomplishments, the struggles, the moments that made us laugh, the ones that made us stronger, all the while we’re noticing the beauty and splendor around us–and working up an appetite. Thanks for your interest in Parenting Well in a Media Age. Stay tuned for more holiday-inspired give-a-ways around the corner. The Teacher is Talking: Your Kids & The Media Give-a-Way!! Oh, today I have two fun books to share! Meet Dot. Dot knows a lot…she’s a fiesty little girl who sure knows her way around an iPad, a laptop and so much more…but she sort of “forgets” to connect with the people and the world surrounding her. 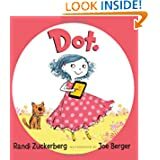 This is the first children’s picture book by Facebook creator’s little sister, Randi Zuckerburg (her first is “Complicated,” for adults). And how timely! (interestingly, it’s also available on Kindle). Just last night, when I casually asked my 8 year old daughter what she wanted for the holidays, the list was a mile long–and every item was something that either plugged in or ran on batteries. As she ticked the items off counting on her fingers, I rolled my eyes. Don’t kids want LEGOS anymore? What about art supplies? Board games? So, back to DOT. The message is simple: it’s great to be resourceful with our many devices, but it’s much more important to connect with people and the world around us. The art work is sweet, simple, and brimming with nostalgia (ironic, right–given the content–or perhaps it was planned that way). My only “complaint” about the book is it seems a little juvenile–at least for my 1st and 3rd graders. Zuckerburg could have gone into a bit more detail for slightly older children, or perhaps have included a “letter to the parent,” with advice or Q&A on media use for kids. And now for the give-a-way! 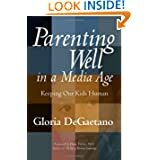 I have a copy of PARENTING WELL IN A MEDIA AGE: KEEPING OUR KIDS HUMAN by Gloria DeGaetano. This book was an iParenting Media Award Winner…lots of great tips, research, and more all about kids and media usage. Fine Print*: Only one (1) copy of “Parenting Well in a Media Age” is available for one (1) winner. “Dot” is not being given away. Must be mailed in the contiguious US. Contest runs today (11.12.13) and ends Friday (11.15.13) at 5pm CST. Winner will be randomly drawn and contacted via email. Please check your spam/junk mail for a message from me. You will be contacted only if you are the winner. Please respond promptly with mailing address. Book will be mailed via media rate from the Chicagoland area on or around 11.18.13. Thank you! Happy Veteran’s Day to all! Without these indivduals fighting for our country, where would we be? 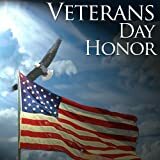 Veteran’s Day began in 1918 as a way to remember those who fought for our country. Other countries also participate and may call the day of rememberance Armistice Day. Our local elementary school puts on a wonderful presentation, complete with a cookies and punch reception, plus kids can bring in their favorite veteran (usually a grandpa) to show off. What a treat for all. 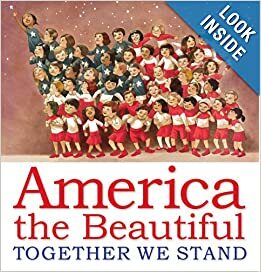 In the meantime, I came across this darling book–a beautiful conglomeration of illustrations from artists across the nation. 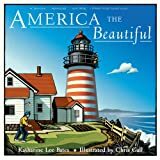 Perhaps you’d like to add it to your child’s library, use it as inspiration for for a budding artist, or talking points as you discuss all-American facts, trivia, and history. Along with those ideas, here are some speechy tips and crafts you may be interested in for extending the holiday into your daily speech practice. Can you name something patriotic for each letter of the alphabet? It’s a challenge for older kids and parents alike! Army…battle/bell…Coast Guard…Defend…Liberty…star/strips…treaty…you get the idea! What about listing A M E R I C A down the length of posterboard or construction paper. Have your child help you write the letters (or place alphabet stickers). Then come up with a word for each letter. Break out your old Neil Diamond music and throw on his 1980’s hit, “We’re Coming to America.” Sing and dance with your child. Be sure to indicate how/if you’d like to be idenfied. First name only. Place name only. Initials. Must be an attachment I can download (don’t worry, photos won’t be used for any other purpose and will be deleted as they are featured). [book images retrieved from Amazon.com and all are by Katharine Lee Bates. The author of this blog has no affiliation with Ms.Bates, merely presenting these titles as resources and entertainment]. Hard to believe that November is among us…and with that, the season of giving thanks. We have some really fun things coming down the pike, thought i’d share! What’s it like to be in someone else’s shoes? We’ll find out with the new-release, “Shoe Garden and Other Stories,” by Brenda Finne. Dot. She’s a little girl who know all about communicating with technology, but will she remember to stop and smell the roses? 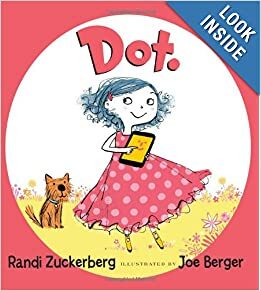 By Facebook creator’s little sister, Randi Zuckerberg, this adorable book pairs well with give-a-way book, “Parenting Well in a Media Age,” by Gloria DeGaetano. (Sorry, Dot’s not up for grabs). Wondering how you can teach your children to be more grateful? Oh, don’t we all?! Tips and ideas coming–along with another great book, “The Secret of Saying Thanks,” by Douglas Wood. We’ll wrap up Novemember with the first Christian holiday-inspired book, “The Sparkle Box” in which a family wraps one very special gift (a token, really) to be presented to the baby Jesus. If you’d like to suggest a topic for The Teacher is Talking, please give me a holler at leslie_lindsay(at)hotmail.com with your teaching ideas, books, games, projects, crafts, and more. I’d love to hear from you! My heart swelled with pride and remorse as I flipped through pages of Kate’s speech binder, complete with progress notes from her SLP and former teachers. A smile smile crept across my face as I uncovered a mound of Small Talk: All About Apraxia folders stuffed with session outlines, nametags, and hand-outs, all unused. A smile because I remember the stories and children with fondness and also because perhaps my work with them was done…my guidance and hand-holding no longer needed because these children were now speaking volumes. On the shelf behind me, a slew of color-coded binders contained valuable information on the elusive subject of childhood apraxia of speech (CAS), bursting at the seams with academic journal articles obtained from interlibrary loans, members of my review board, and hard-core research. Beyond all of that, in a file cabinet, I came across all of the rejections I receieved from various publishers as to why this promising project was not exciting enough, and how they wished luck as I placed my project. And then, an acceptanace letter and a publishing contract. My heart pounded again as if seeing this for the first time. On another shelf lay scores of books on child development, speech and language acquisition, special needs, and IEPs. Someone once told me, “You’ll be amazed at all of the books you read just to write one.” It’s true. My fingers and my brain have wrapped themselvs around volumes, deciphering words, phrases, and research jargon just to create one little book I can call my own…and your own, too. You see, I wrote SPEAKING OF APRAXIA as a way to fill a need. 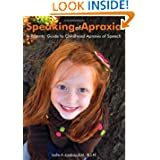 When my own daughter was diagnosed with Childhood Apraxia of Speech (CAS), I couldn’t find all of the answers I wanted in a central location. Sure, I found a little over here…in this book. And a little more on that website…and still yet some more from an in-person group I attended. There were words of advice on a listserv and message board, on a Facebook page…but there wasn’t anything in one place. As a busy–and often scattered parent raising two young kids–I wanted an encyclopedia of sorts on childhood apraxia. I figured if I did, so would you. This book is really a labor of love–for you and your little ones and for my daughter as well. While the clean-up is mostly over, the notes and binders, books, and contracts packed away, the book lives on. Children are speaking fluently, words and phrases are mastered, and laughter is heard. Thank you for allowing me to do my work as a mother and writer. Book available thru Amazon, Barnes & Noble in-store and on-line, as well as thru the publisher, Woodbine House. Now in Kindle! !